Hearts for Healing developed out of the Arts for Healing program in 2003. Gerrit Greve is an internationally acclaimed fine artist and co-founder with Ralyn and Nate Wolfstein of the Arts for Healing at Scripps Memorial Hospital, La Jolla, in 1993. Arts for Healing has been enhancing the hospital environment and promoting healing for patients, their families, and staff members of Scripps Hospital for over fifteen years. Greve was the driving force in establishing the Hearts for Healing Program at Scripps Memorial Hospital, Encinitas in 2003, and has been its director since then. Beginning in 2008, Greve has expanded the program beyond Scripps Hospitals to include many more hospitals and medical clinics, with his “Art with a Heart” Program and “Healing Waters” Program. This expansion has been primarily based 0n working with children in the adjacent communities as a community outreach project. Working with local schools, community centers and other programs and centers that help the under-served youth of the community, the children create art to be placed in medical facilities in their neighborhoods. The art that the children create is auctioned off to help perpetuate the program and benefit the community medical centers. The buyers of the art works are encouraged to donate the pieces back to these medical institutions to enhance their healing environment. Because of the success of the program and the positive reception it continues to receive, Greve is looking to expand this program nationally. I chose to attend this event not only because I love the downtown L. Street Gallery venue but the thought of Healing Waters made me anticipate the sensual sights and sounds of healing water, whether it was ocean blue surf, gentle sun showers, babbling brooks, or evaporating mineral hot springs. This was an exhibition and a silent auction with proceeds (over $7,000) going to Family Health Centers of San Diego and (ARTS) A Reason To Survive. The art works included student creations as well as paintings by Gerrit Greve and sculptural gourd vessels by Robin Przybysz. I think I’ll rename it ARTC, A Reason To Collect. Gerrit Greve is founder of Arts for Healing and coordinator of “Art with a Heart”: A Project with Scripps Hospital Encinitas The Arts for Healing Program. His paintings create a symphony of musical color notes that allow the viewer a meditative moment, a sense of great joy, or a journey down the river of one of life’s many challenges, but most importantly for this event his art inspired the kids to create their art for healing. At the pre-auction reception I got to hear the testimonial of six year old Betzabeth Avalos, one of the patients helped by Dr. Newel of Family Health Centers of San Diego, a private nonprofit community clinic organization dedicated to providing affordable services to the medically underserved throughout San Diego County. I also enjoyed reconnecting with Matt D’Arrigo, founder of (ARTS) A Reason To Survive. In 2007 he opened the Pat D’Arrigo ARTS Center at NTC Promenade in Point Loma, offering a wide variety of in-house programs as well as partnering with numerous organizations throughout the San Diego community to address the needs of children and teens as they face challenges of adversity. Preview the book Healing Waters . This book is 160 pages in full color showing the paintings of students involved in one of the Arts for Healing projects directed by Gerrit Greve. Each of the paintings is accompanied by a short biography of the student and an artist’s statement of what it meant to be involved in this project and how their painting is meant to heal others. As you peruse these vibrant, joyful works of “heart”, culled to create this remarkable book, we see not only an expression of how the students interpret a giving heart, but how they master the fine art skills of laying down paint, design elements, composition, color theory and, perhaps most importantly, how they convey their love in a gift of art. 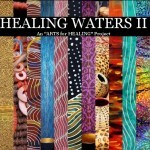 Click below to view pages of the “Healing Waters -2″ Catalog.